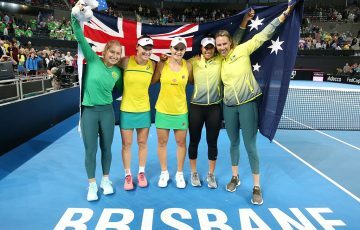 Ash Barty starred in Australia's stunning victory over the United States, a result sending the team into the Fed Cup World Group semifinals. 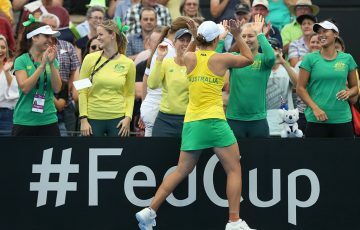 Led by Ash Barty, Australia’s Fed Cup team has advanced to the World Group semifinals for just the second time since 1993. 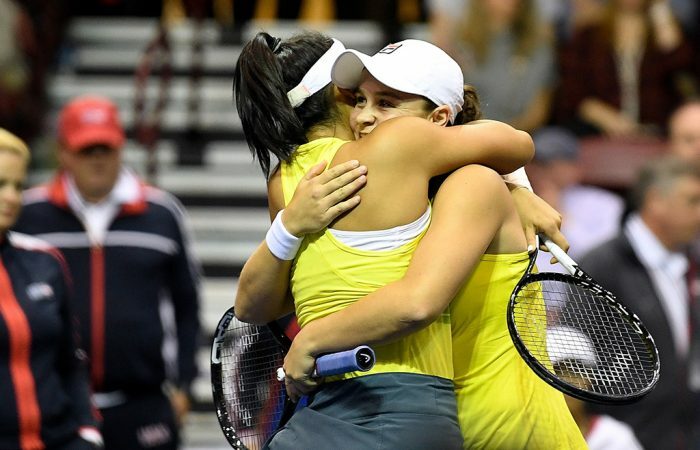 Barty and fellow Queenslander Priscilla Hon combined to beat Danielle Collins and Nicole Melichar in the live fifth doubles rubber, handing Australia a 3-2 victory over the United States in Asheville, North Carolina. It’s Australia’s first appearance in the World Group semifinals since 2014, and just the second since the green and gold advanced to the final of the competition almost 26 years ago. Barty was crucial to that result, winning both her singles rubbers before the doubles to go a perfect 3-0 in Asheville. The 22-year-old has now won 11 consecutive Fed Cup rubbers and extends her competition record to a sparkling 14-2 across both singles and doubles. 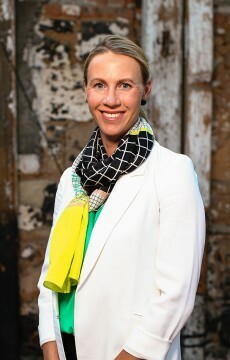 “I’ve said right from the start, it’s an honour and privilege to be able to play for Australia. When Mol (captain Alicia Molik) asked me to play three times during the week, I put my hand up absolutely, do whatever she asks,” Barty said. “For all of us, I’m so proud of every single person sitting on this table. I think in particularly Mol having the belief and the faith in us, knowing that whoever she puts out on the court, we can back in 100 per cent. While Barty – who made her competition debut back in 2013 and has become entrenched as the team’s No.1 player – is now something of a Fed Cup stalwart, Hon was at the other end of the spectrum, making her first appearance for Australia. When you talk about throwing a player in the deep end, this was precisely that. And Hon delivered, showing great instincts at net and rarely looking overawed while sharing a court with three other players owning vastly greater levels of experience at the top level. Tasked with serving for the match, she completed it with a hold at love. Few were more proud of her performance than Barty. “It’s the best feeling in the world, it really is. I’ve been able to have a little bit of a taste of it before. But certainly I said to Pri, to all the girls after the match, ‘How good is Fed Cup? How good is it playing for Australia?’” Barty said. “These are the moments you remember for the rest of your life. You play a million matches on tour, but the best memories come from these Fed Cup weeks. It’s just really special that I’m able to be here. Hon was keenly aware of the stakes when she took to the court. “I’ve never sweat so much before,” she admitted. “Even playing for myself, I know what nerves are, but just having your whole team, you’re playing for Australia obviously, it’s a complete different feeling. With a new-look team at her disposal – both Hon and Astra Sharma were making their debut, while Kimberly Birrell was playing in just her second tie – and all players entering the weekend in great form, Molik said the selection process was challenging. 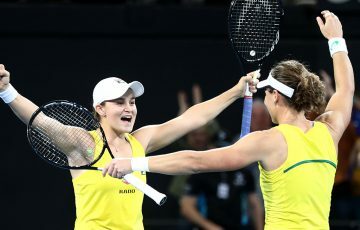 She chose to pair Barty and Hon in the belief their games would complement one another, and her decision was vindicated when the duo completed a straight-sets triumph. 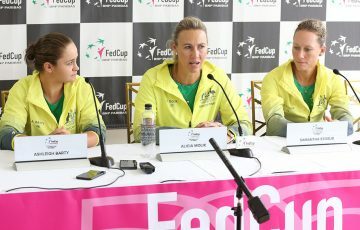 Thanks to this impressive depth of talent in the Fed Cup squad, Australia finds itself in a great position ahead of its home semifinal against Belarus in just two months’ time. “From my perspective, that’s important going forward, that we have so many young players. There’s still quite a few beneath them who are pushing for spots on the team, as well,” Molik said. “We love playing at home. I mean, we’ve travelled so much. As Australians, we probably spend more time on the road than players from other nations. So the fact we have a tie at home, it’s important to us. “You (the American team) had your junior players here enjoying the tie. Now we have that opportunity to do the same back at home, get a lot of young girls involved in camps. That’s what we make the focus of during Fed Cup week, too, is just displaying the team’s great tennis to the world and having a lot of junior camps and activations around it, which are really important.